A while back, when my second grade was working on the Ojo de Dios, our lil table top trash cans were becoming filled to the brim with yarn scraps. When I asked a student to empty the trash cans and throw away the yarn, the kid paused, looked at me and said, "What?! Throw all of this pretty yarn away? BUT WE NEVER THROW ANYTHING AWAY IN HERE." Okay. So I may or may not have created mini-hoardering monsters. They learn from the best, what I can I say? 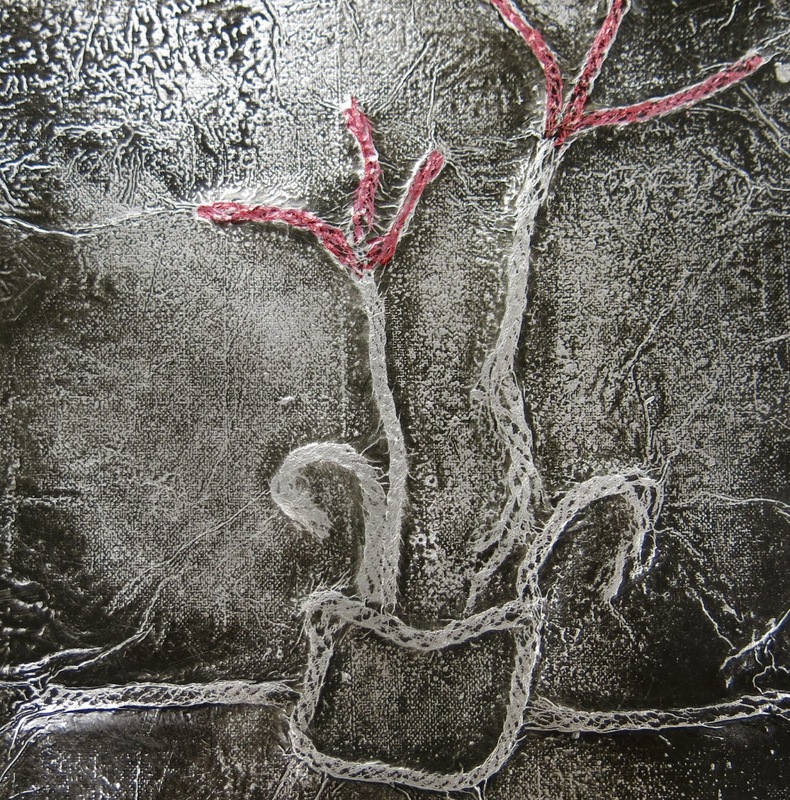 After the kids planted the seed of creating with our scrap yarn, I began to give it some thought. 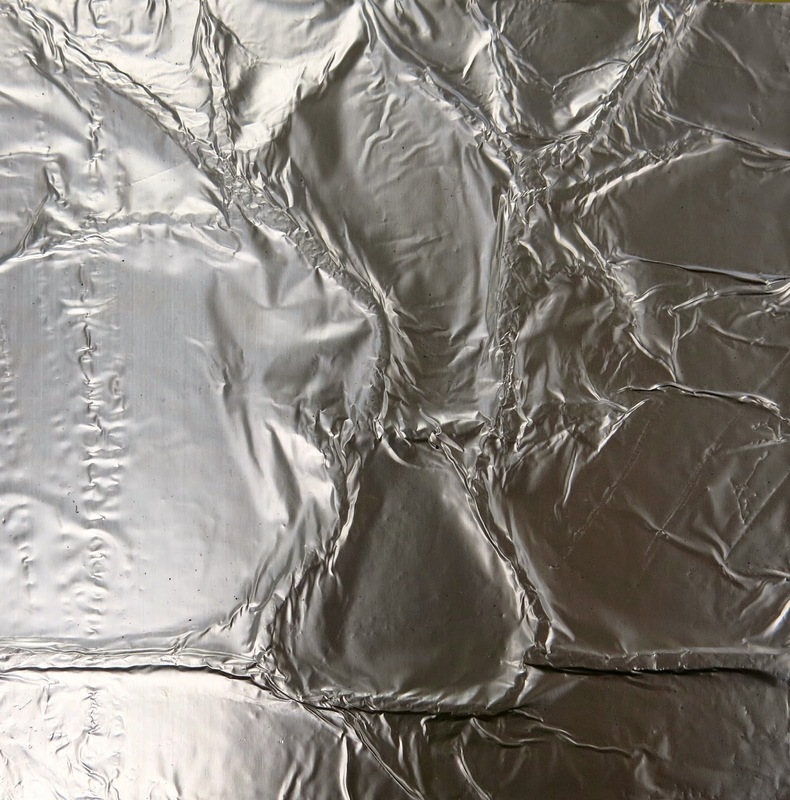 It was then that I thought a lil foil relief project might be just the thing. This project was quick, easy, environmentally friendly and tied in with our year long study of Mexico. * Spray adhesive. I like 3M the best. * Super cheapo black matte spray paint. I buy the $1 a can junk. * Matte board for the frame 8" X 8"
To start this lesson off, we read The Legend of the Poinsettia by Tomie de Paola. We did start this project before the holidays so it was a great tie-in. Each student was given a 6" X 6" piece of matte board that had been sprayed with a light shower of spray adhesive. At their seat, the students were to create a miniature still life of a poinsettia. 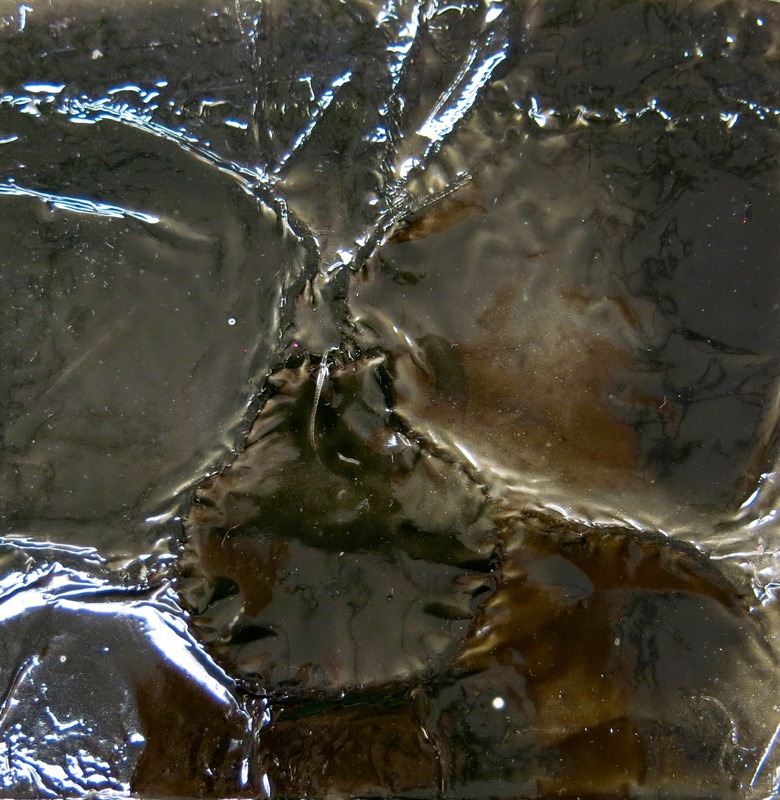 Once finished, they brought the board to me where I hit it with another shower of adhesive and placed a piece of foil on top. At their seats, the students used their finger tips to "massage" the foil and reveal their yarn design. Using the finest of steel wool, the kids took to burnishing off the spray paint and revealing their design. This was then given a wipe down with a tissue to remove any spray paint dust. From there, the kids used Sharpies to add some color to their masterpiece. Most of them chose to color on the raised areas which was fine with me. Some decided to color the entire piece which was cool...but did not make for a happy Sharpie. I love the tulip look of the flowers in this pot. In the story, the young girl is helping her mother weave a new blanket. We looked carefully at some examples of Mexican blankets that I brought in and then began the second phase of our project. 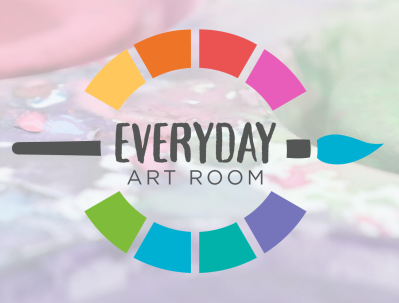 On our first day, we simply painted a variety of thick and thin lines in different values of color on our 8" X 8" board. 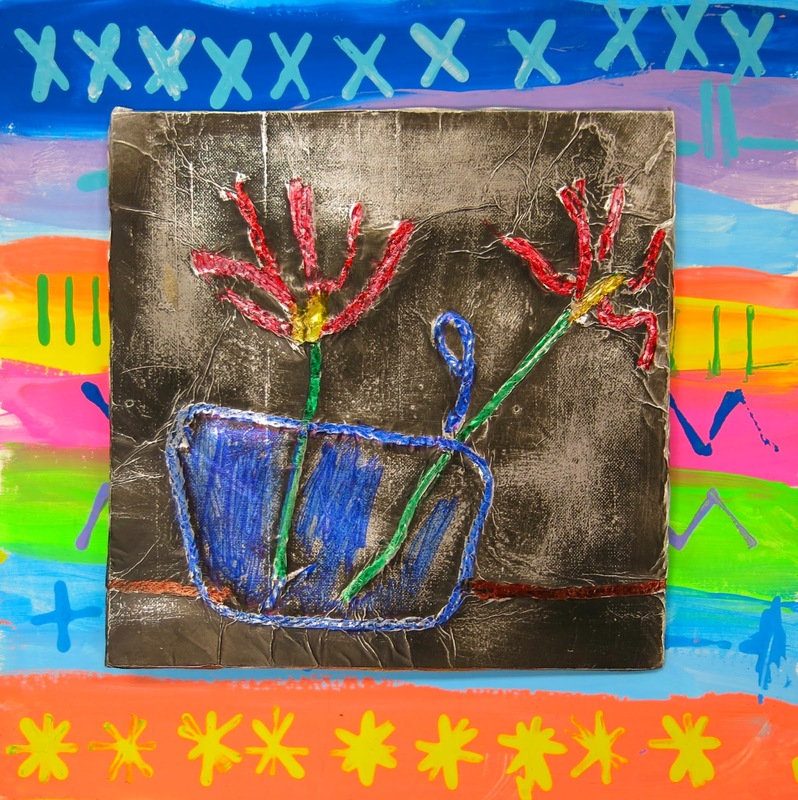 The following art class, the kids learned how to create different patterns in their painting by printing with cardboard. They loved experimenting with different designs. I loved these so much I was kinda sad to see 'em covered by their metal pieces! This project was so easy and fun and I totes loved the results. I keep thinking of other ideas for this kind of project. Like if the kids learn about Picasso, they can create a yarn-y abstract portrait. Or maybe a cool landscape that is continued onto the frame of the piece. So many ideas! Do you have any that spring to mind? Our next unit of study is circle loom weaving which you know I love. The kids have already started to paint their plates which have a similar design as these painted frames. This also proved to be great because we gained some experience in color mixing and pattern making before diving into our plate painting for the circle loom weaving project. Whatcha think, would you give this a go? 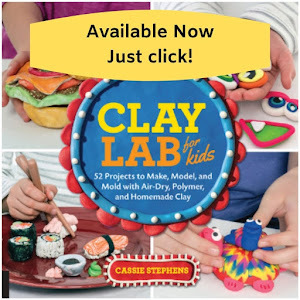 I promise your students would love it! AND moral of this story: Not throwing anything away, even bits of scrap yarn, can yield some pretty fantastical results. Until next time, y'all! It's called priorities, y'all. And I've gots 'em. By the way, can I make a confession that's not really a confession because I betcha have figured it out already: I'm breathing down the neck of 40 and I still like to play dress up. Is that awkward? Should I seek out a support group? I'm guessing it will be the most superbly dressed support group in all the land, riiiiight? Who's hosting the first meeting, y'all and will there be cookies and grape-flavored adult drank? Count me in. No, you aren't experiencing deja vu. 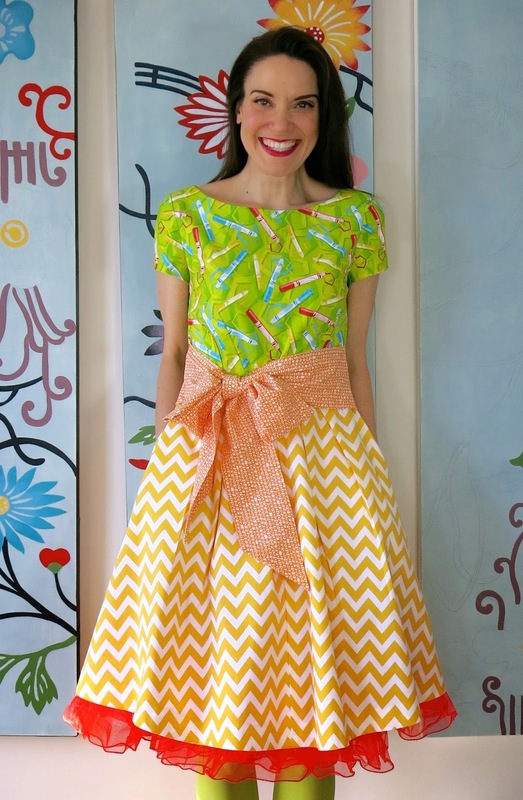 Yes, you've seen this dress pattern three times. Ahem. 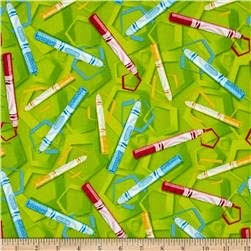 Remember when I done tole you last week I was making three dresses outta this pattern? There was this Mondrian number, this colored pencil piece and now whatcha got here. 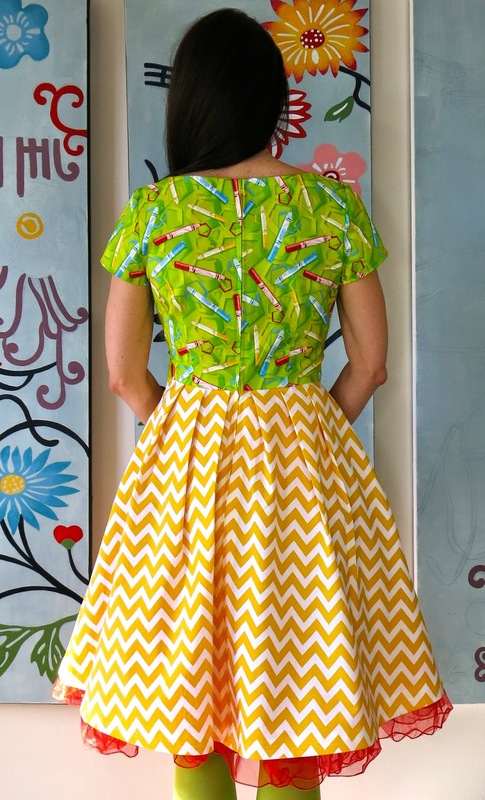 Do I have to tell ya that I totes dig this dress pattern? 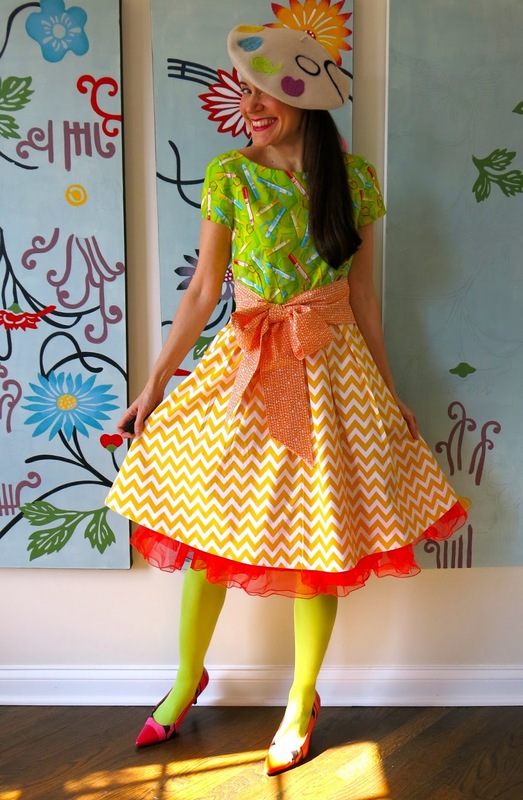 I mean, it has everything I love in a dress: a form-fittin' bodice, a fat flouncy skirt and, of course, a big ole bow. Puurrr-fectimacation. So when I shop for fabrics, I usually buy first, think later. My hands move much faster than my brain when it comes to swiping that credit card through the lil reader. My hands are all, "hurry before that sluggish gray mass between her ears finds out we just dropped coin on even more fabric!" I usually walk outta the fabric store like I'm waking up from a dream. "Whuh just happened and who just stuck three yards of marker fabric in my bag?" Meanwhile my hands are all high-fiving each other (which looks quite ridiculous to be standing in the parking lot of a craft store clapping at your confused self, but, such is my life). I actually scored that sweet marker fabric from here. Sadly, they are all out of the green but do have some lovely orange on super sale. 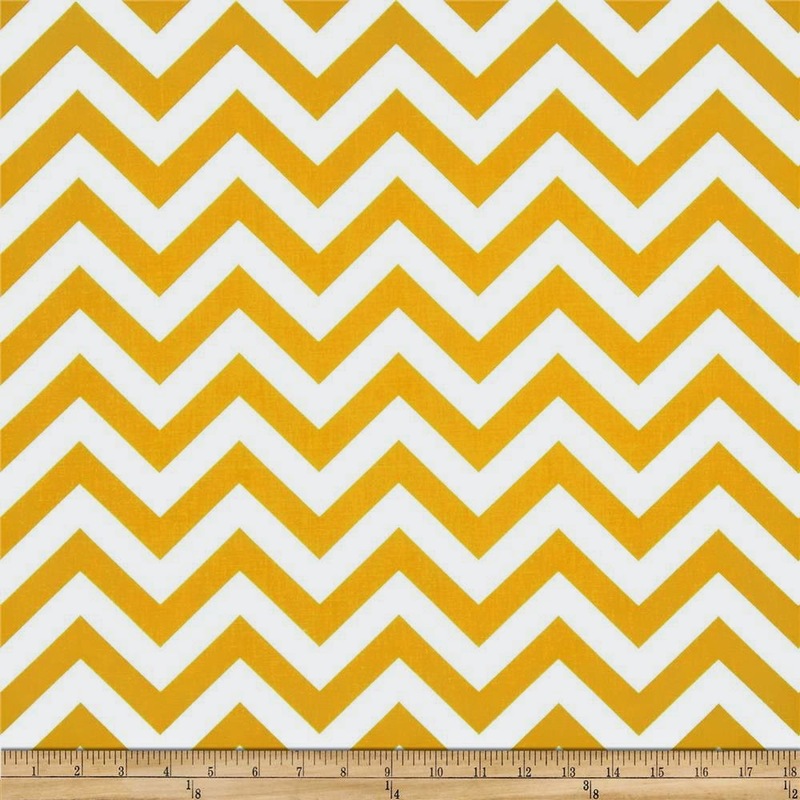 The chevron came from a local shop but I did find a similar one here for you. If this looks a pinch familiar that's cuz I totally used a gray version in my pencil dress. I just love this print so! You can find this orange goodness here. 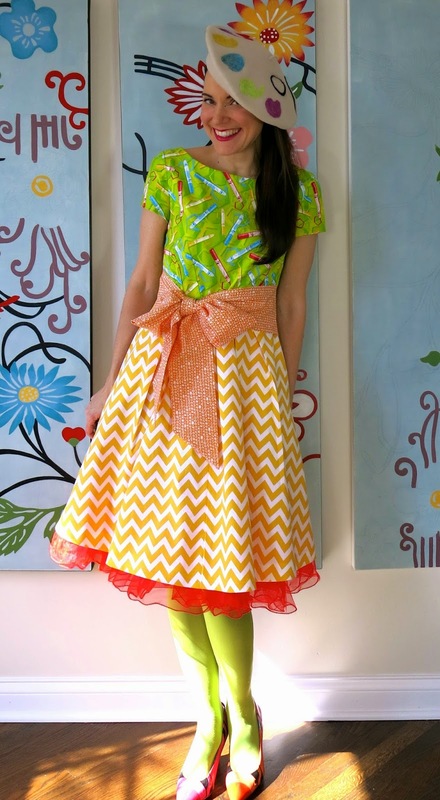 After throwing all of these prints together, I realize I look a lil bit like a can of Mountain Dew meets Orange Crush. Which I see no problem with atall. But I am from the South so you know that stuff is our equivalent to water. If you think I'm fibbin', go google yourself "Mountain Dew Mouth" and tell me I'm lying. Go on. I'll wait. Nuther refill of Dew-Crush anyone? No? How bout just a cuppa sugar with a splash of syrup and drizzle of honey. Something to dip your Moonpie in, y'all. I'll have you know that this here is the only dress outta the three where I didn't screw up the pleats. And there were only, like 9 pleats, y'all. Le sigh. To finish off my Dew-Crush-tasticness, I decided to wear this palette hat I felted ages ago. It was just a thrifted find that I gave a lil make over to. That craft was super simple. You can go here for all the gory deets. In my pics you totes can't see my shoes but here they are! I painted these ages ago and they are starting to show some wear. Mostly cuz I painted them with acrylic and I shoulda gone with some sort of leather paint. You can check these out along with some other wacky painted footwear here. And there you have it, another freaking dress thanks to my Snow Days/Sew Days. 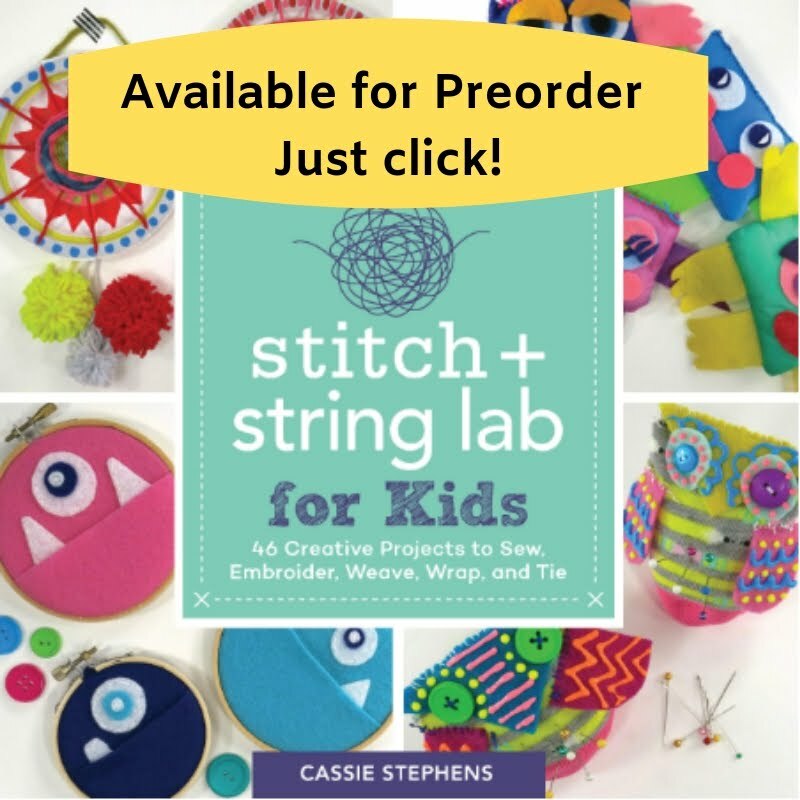 If you aren't a stitcher and have found these posts not your cup of tea, my sincerest apologies. I do hope to be back to art teacherin' sometime this decade. In the meantime, I've got a house to not clean and another dress to complete! Later, y'all! Wait. Whut wuz I saying? Weelllll, don't hate me because I'm so athletic, hate me cuz I scored an entire week off! That's right, y'all. That snow day I mentioned on Monday morphed into a glorious thing called a Snow Week which is just as glittery, sparkly and absolutely divine as it sounds. Especially since we've got built-in days so we won't have to make up for lost time. And especially-especially since this dress has been an UFO (UnFinished Object) in my sewing room for the last coupla weeks and now I can scratch it off my never-ending list of UFOs (y'all. There are so many UFO's up in my sewing room that they are thinking of filming the next X-Files movie in there). But enough of this rambling (guess who hasn't left the house in 4 days nor spoken to anyone besides the cat and her hubs?! 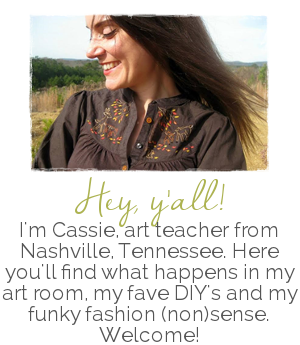 ), let's talk dress, y'all! 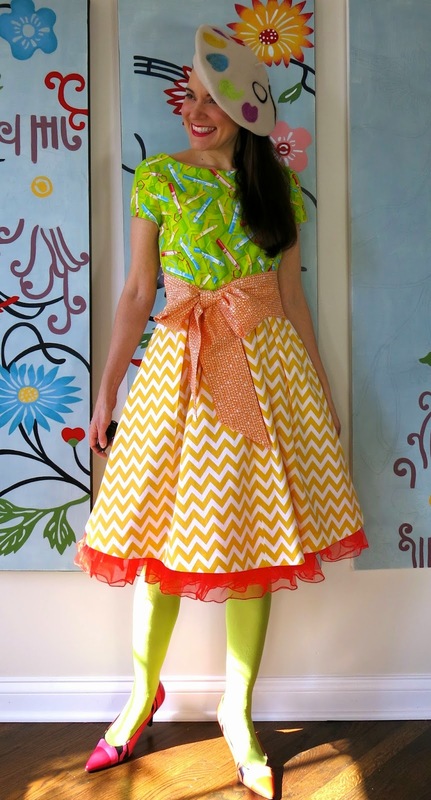 So when I showed you this dress, I tole ya that there were three more from the same pattern in the works. This here's dress #2! I've never worked on three dresses at once before and I gotta say, I kinda liked it. The progress was a lot slower, obvi, but I liked working piecemeal like that. I did manage to screw up the pleats every single time on every single dress but, you know. When you work with limited brain capacity, you come to expect such things. 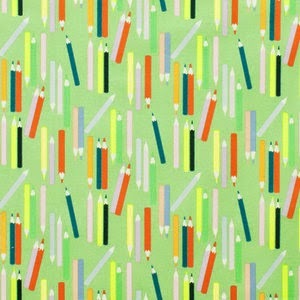 The fab fabrics I used were the pencils by Alexander Henry and these scribbles by Ed Emberly. Super cuteness, right? 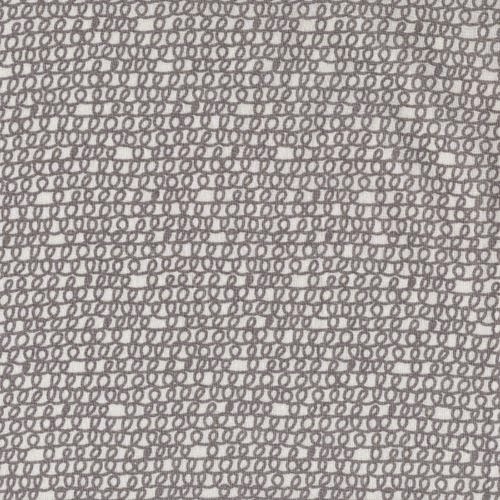 In fact, Anthropologie used that pencil fabric in navy for a skirt they sold last year. 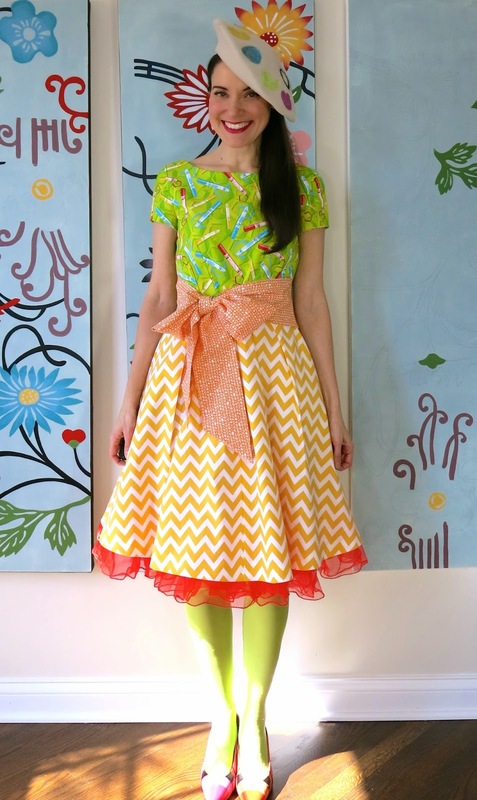 I love the color palette of this light green fabric, it's feels very retro to me. For this dress, I opted to go sleeveless mostly cuz I didn't have enough of the scribble fabric. Which is cray because I always over buy my fabric. This is also how the dress is supposed to be worn. But as you mightah noticed in the early snaps, to make it work with the bolero, I did something a lil different. But wait, DID SOMEBODY JUST SAY BOLERO?! Das right, y'all! I made a wee jacket to go with my dress! I decided I needed a new outfit for the art teachers conference (NAEA for those of y'all in the know) in New Orleans where it might be a lil chilly without sleeves. AND everyone knows a jacket is all kinds of professional-looking which I'm hoping to fool people into thinking I am when I present a whopping four times. Yikes! In reality, I should prolly be working on my presentations...good thing my Magical Totally Professional Looking Jacket will fool folk! "Golly, Janet, what was that presentation even about?!" "I have no earthy idea, Eunice, but it sure was professional. I mean, did you see that jacket?!" Not to mention, it's reversible, y'all. And I kinda dig it with a lil faux lapel, don't you? It's like a lil peak-o-pencil, know what I'm saying? Here's how it's supposed to be worn without the faux lapel. It's a lil too blue with this ensemble. Not to mention between the jacket and the waistband I do look a lil bull-fighter-esque. Toro! Toro! Like I said, reversiBULL. It's all coming together now, riiiiight? So the pattern I used was that vintage number shown above. It's called "Advance". Not to be confused with "Advanced" which I would never use. The silly pattern did call for me to do some hand sewing and I was all "whuuuuut?" and the pattern was all, "yeeeeeesssss." But I had to lay down the law. It's 2015, I ain't hand sewing nuthin when I got a machine that can do it in a blink. So my bolero is all sorts of top-stitched where it isn't supposed to be. But whateves, tis the reason I ain't advanced. By the way, tell me honestly, does this look like I have red toilet paper accidentally tucked into the backside of my dress? Well, does it?! A good friend would be honest with me, ya know. But wearing it this way, with the straps criss-crossed (will make ya Jump!Jump!) around the waist and tied in the back works best when wearing it with the bolero. Says me. AND I kinda dig this look all on it's own. But that's because I'm all about the big fat belt. And there ya have it, folks! I promise I won't share another dress post for at least a couple of days (ahem). Until then, stay warm, buddies! Well, kids, today is one of those days that every teacher on the planet dreams of: A Snow Day! In Tennessee that means we scored a whooping 2" of ice pellets (which, as it turns out, sounds like someone is throwing rabbit pooh at your windows all day. Not my fave sound in the world). One of the best things to do on a Snow Day is turn it into Sew Day! And that's just what I did in finishing off this Mondrian Dress-terpiece. 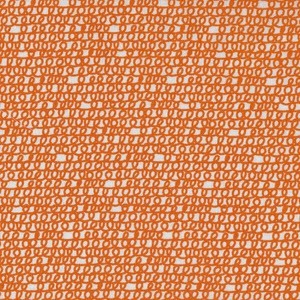 The whole idea started when I saw this fabric and popped it into my virtual shopping cart faster than you can say, "OMG, don't you have enough fabric already?!" Answer, no. Also, if anyone ever says that to you they are: A. Being absurd. and B. Prolly your husband. So see A. Once the fabric arrived, I set off to JoAnn's to pick up a new dress pattern. I've been using and reusing, like, the same 4 patterns and Ima starting to get a lil bored. Not that this here pattern is much of a stray from my norm. 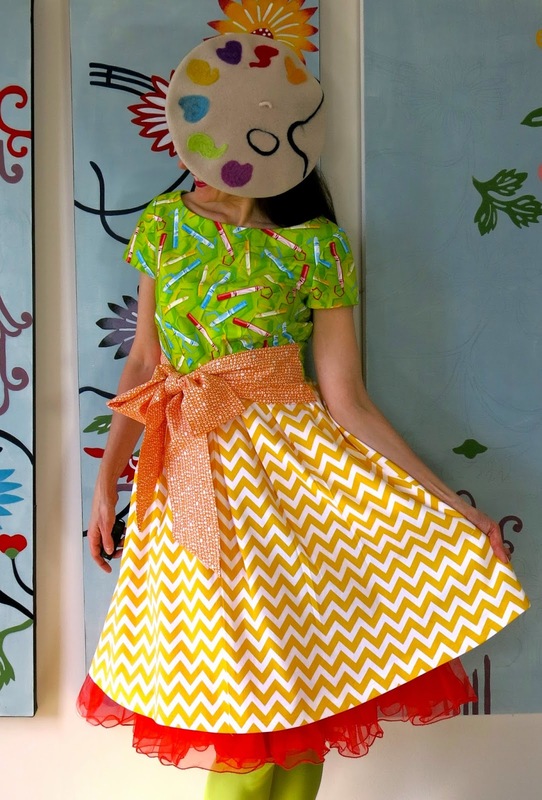 I'm all about the 1950's fitted bodice, flair skirt deal. 'Tis my fave. 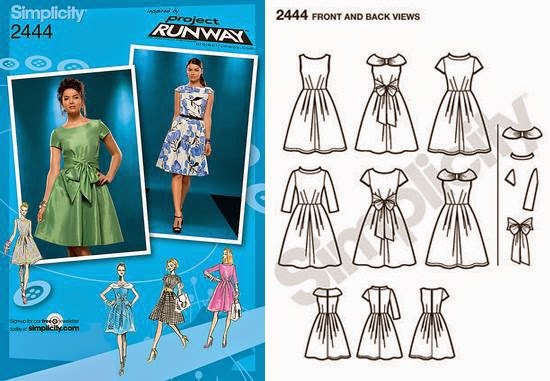 I'm currently working on two other dresses from this pattern, each with a diff collar. I'm hoping to finish 'em off with tomorrow's snow day (yeppers, I scored a Snow Day Double Header, yee-haw!). I decided to go with the "stand collar" for this dress because I wanted it to have a 1960's feel. But more on that in uno momento. Let's talk about Simplicity #2444 for a sec, kay? Do y'all sew? 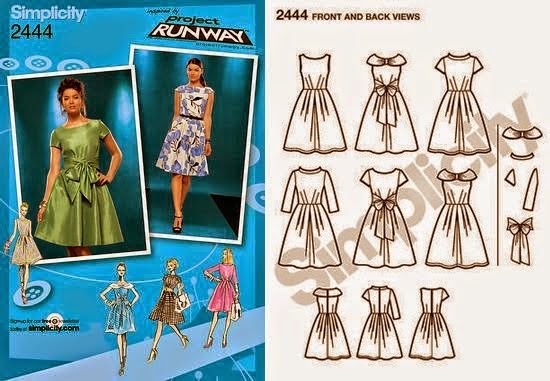 Personally, I love the Project Runway patterns because they come with a ton of options and are pretty stinkin' simple. 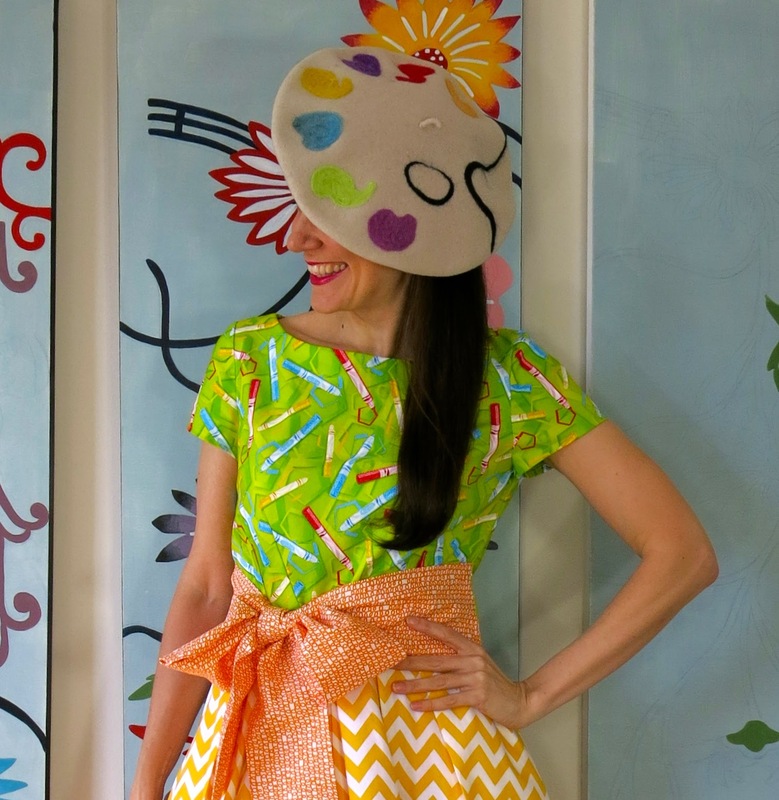 Also, I secretly stalk Professor Pincushion who creates videos of many of the PR patterns and walks you through the entire dress-making process. Yes, you read that right. No, I'm not even kidding. She's totes stalker-worthy. So, the stand collar. I know the fit and flair of this dress is mostly 1950's but I wanted a nod to the 60's. 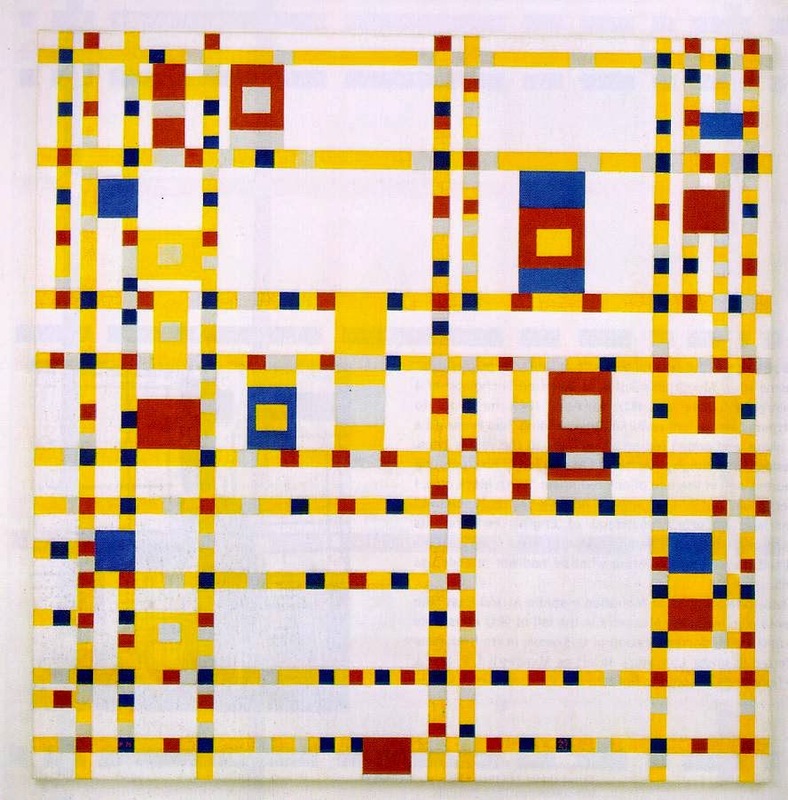 Mostly because this era of Mondrian's paintings have a super mod vibe to me. I'm happy with the collar, I think it gives this dress a bit more attitude than the no-collar version woulda had. Whatcha think? 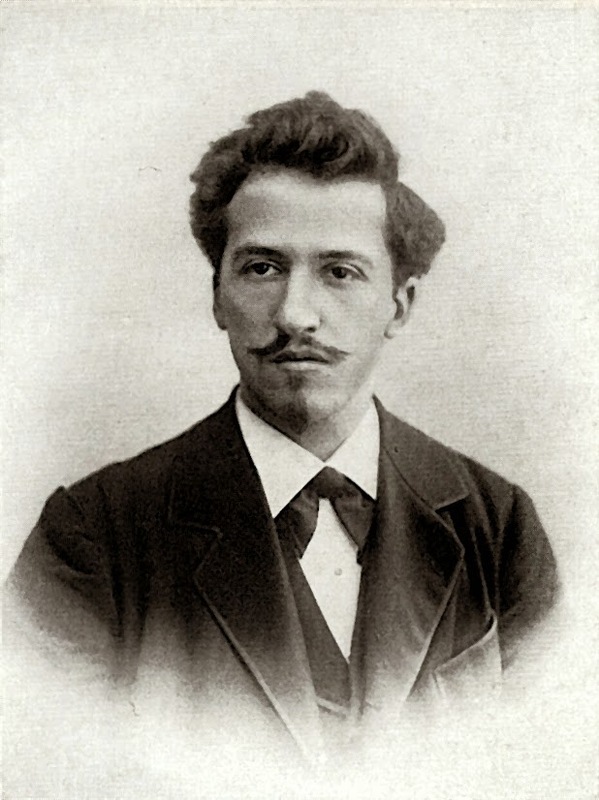 So let's talk ole Mondrian for a moment, shall we? I'm gearing up to start a big fat hair Primary Colors unit with kindergarten and who better to showcase than this ole boy? What I was totes bummed to find is that there is, like, one kids book on Mondrian and I wasn't loving it. Do you all have any recommendations for me? I recall learning about Broadway Boogie Woogie (1942-43) in those dark and sleepy art history sessions in college. Please tell me I'm not the only one who always fell asleep and woke up with drool-soaked notes. How you gonna turn off the lights, talk in a monotone voice and not expect me to snore my way through your course?! I'm hoping to make Mondrian more 'citing for my kids. As I was stitching up this dress, I got the idea to MOD-ify some booties (get it, MOD-ify 'em?! Sometimes my incredible sense of humor even leaves me in tears. Of sadness. That no one else is nearly as hysterically humorous as me. Ahem.) 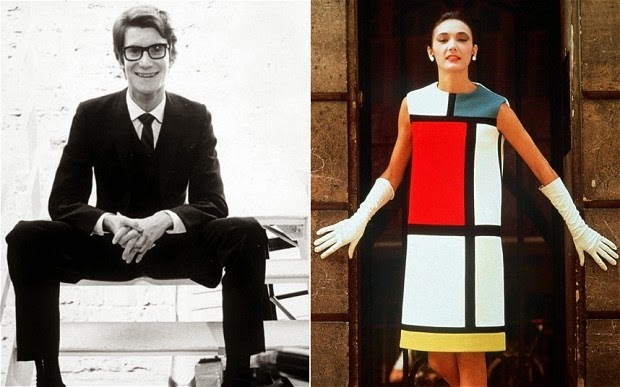 Mostly cuz I always thought that when I got around to Mondrianin' a dress (yes, now he's a verb) it would look like this 1965 Yves Saint Laurent number. I love Yves Saint Laurent. He studied under The Greatest Designer of All Time: Christian Dior. Oh my goodness, don't even get me started on my love of Dior. It's borderline cray. But back to Laurent. This dress of his is so mod and so 1960's that I always thought it'd be the perfect thing to stitch up. The prob? I'm not a fan of the shift dress. I get it, it's comfy, it's classic. But it's just not my bag, baby. 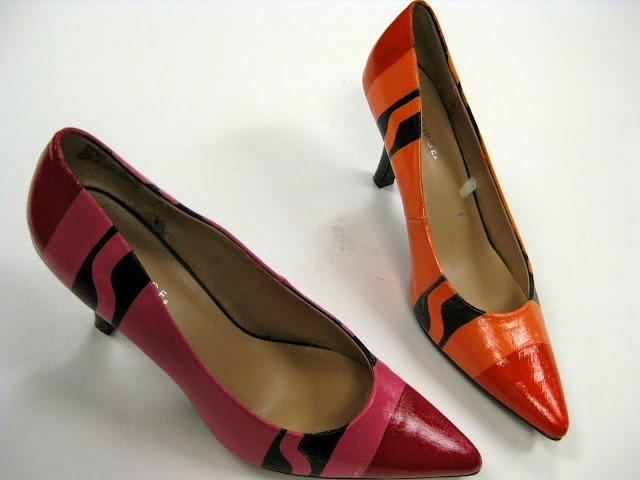 So some 1960's Mondrian-inspired booties would just have to do the trick. Now, before I go too much further, lemme just throw in a disclaimer: I prolly shouldn't even be showing you this here DIY. Mostly cuz I just used whatever I had on hand: booties and acrylic paint. I hear they make paint specifically for leather. And I hear you should treat your leather before painting it. I learned all this after I started painting and decided to do a lil googling. Eh, says me. Too late now. This truly was a simple and speedy DIY. Just mask off some geometric shapes and start a-painting. I used a coupla coats. And allowed to dry before pealing off the tape. Some of the acrylic did come off with the tape (nice job, acrylic) so I did have to do some retouching but it really wasn't a biggie. And I was pretty psyched with how they turned out. Y'all should totally do this. Then we'll be Mondrian Bootie Twins! Wait, that doesn't sound right.